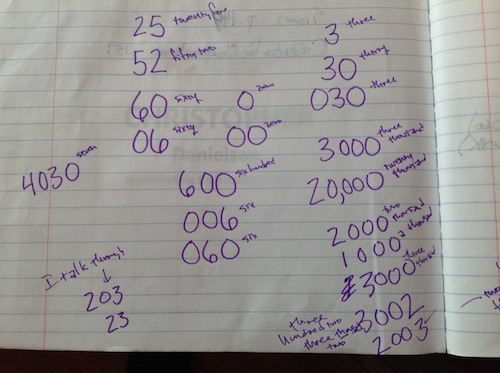 This entry was posted in Number and tagged 6 years old, number, place value, Tabitha. Bookmark the permalink. Despite the old saw that math is “black and white, right and wrong” here is an example of where we see that this is not so! Understanding math requires conditioning, acculturation, and social interaction as well as number sense. Good stuff! The other takeaway that I have here is that it is SO important to be able to ask follow-up questions, even when the answer is ‘the right one’ In a classroom, it is such a challenge to remember to do this and to find the time reliably to do so.